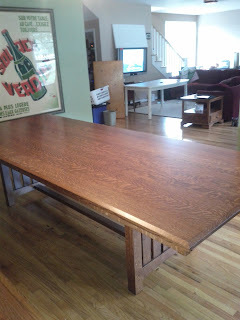 This is our new dining room table. I would like to say its our first dining room table. When we were first married we used a round marble table that was from Gary's office as a dining table. It was large, heavy, bulky, cold and only sat 4 people. For larger parties we compromised, as only you can with a bachelor, we custom ordered glass to lay on top of a pool table and used that to seat 20 for Thanksgiving dinner. It was a little tall for a regular chair, fortunately we had plenty of office chairs to choose from. I custom sewed table cloths in large odd sizes. Today I have to fold them over 3 and 4 times in order to use them on our smaller tables. When we moved into the new house I went to a local furniture shop in Montrose and bought the only table I could find. It was blond/white and $125 for 5 pieces, including 4 chairs. What a steal! We figured it would be temporary so I didn't worry when Lainy Ann stabbed it with her fork, Connor used markers on the bottom and the spokes on the chair broke and fell out. We purchased folding chairs to use instead, then we found the exact same chairs at a garage sale, we purchased them and they broke too. *shrug* What do you expect for $125 and 8 years? The last few months we have been hosting large sit down meals for 20 or more. We have been using up to 3 tables including our sad tiny kitchen table. But now we have our perfect dining room table. I have hunted far and wide for an all wood, no extensions, 10 foot table. This isn't just furniture for us; this is life. This is meals with our family and our extended family and loved ones. This is Thanksgivings, Christmases, Easters. This is family game night, friends game night. I anticipate boyfriends and girlfriends sitting at this table and getting interrogated by siblings (and daddy). I anticipate fiancees and grandchildren all sitting at this very table; spilling milk, drawing a picture for mommy, laughing, joking, playing games and enjoying each other. This is life. Our life. Which requires a table for 12.